We have always been keen to support oversees projects, most of which are established charities run by or overseen by Rotary Clubs neighbouring a particular project. This way we can be assured that any money or equipment that we donate falls into the right hands. A selection of the projects that we have recently supported are shown below to give a flavour of our oversees work. international@clactonrotary.org and we will arrange a collection or drop off point for you. assisting practically with education, healthcare, and community development and through evangelism. As part of our club’s on-going support for a community in Benin we recently undertook a project to assist a school, in the area of Avergamy a small village some 200 plus miles from Cotinau. Although in the past we have raised funds to help the basic needs of the village, Benin Christian Support informed us that a lot of the children who managed to attend the mud and wattle school lacked all the basic needs to help with their learning. 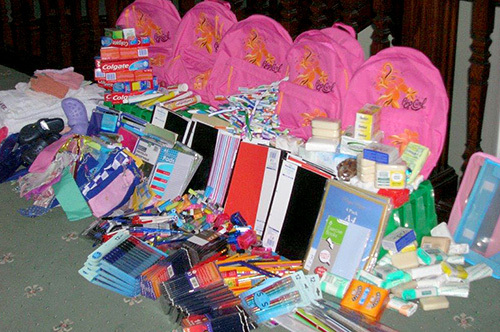 Members donated all the needed items for 100 children including pens, pencils, erasers, pencil sharpeners, rulers, exercise books, writing pads, tubes of toothpaste, face clothes, toothbrushes, bars of soap, spoons, some school bags, and some sandals,. Our ladies of Inner Wheel kindly assisted by making and supplying pencil cases for each child. We are pleased to say that the children now have all these much valued items and are able to participate fully in their schooling. You can learn more about the excellent work of this charity HERE.